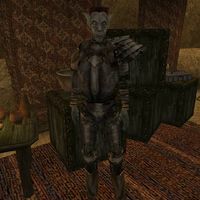 Nalis Gals is a Dunmer trader who can be found in the lower level of the St. Olms Canton waistworks in Vivec. He has a small selection of goods for sale. It seems he almost became involved with Nalvilie Saren, but was warned about her by his brother. This page was last modified on 13 April 2013, at 01:17.